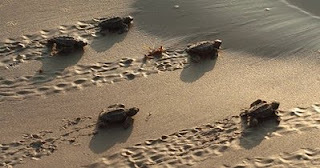 I'm back from some travel (that didn't involve rescuing sea turtles in 115+ degree heat - imagine that!) Upon my return, the Aquarium's mapping specialists notified me that we were still receiving strong signals from our released dolphins. 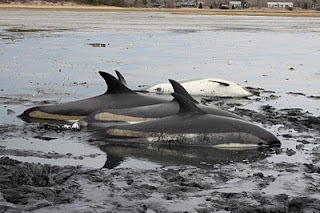 In the photo below you can see the three live dolphins in the foreground and the deceased dolphin on it's side in the background. 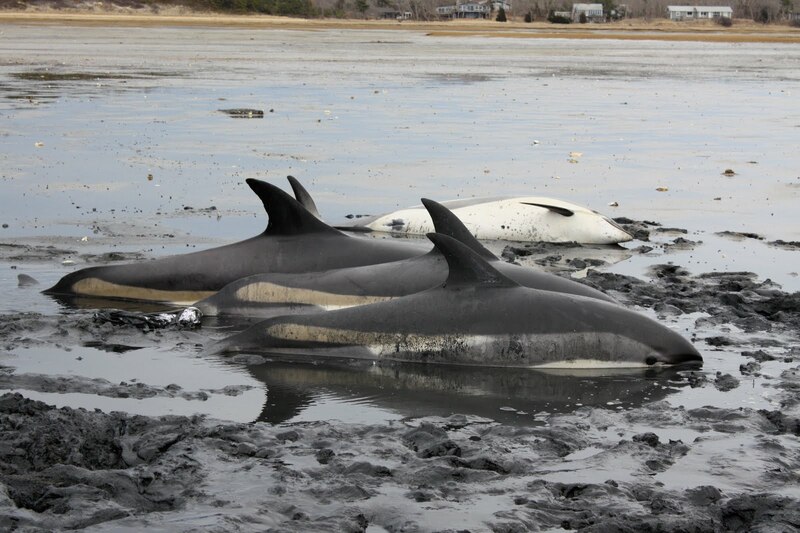 The other live dolphin was a smaller animal found in the mud about 50 yards from this group. In the photo below a team of us prepared to perform health exams on the dolphins. Kerry performed a health exam on the smaller dolphin found separated from the group. In the photo below Kerry collects a heart rate using a stethoscope. 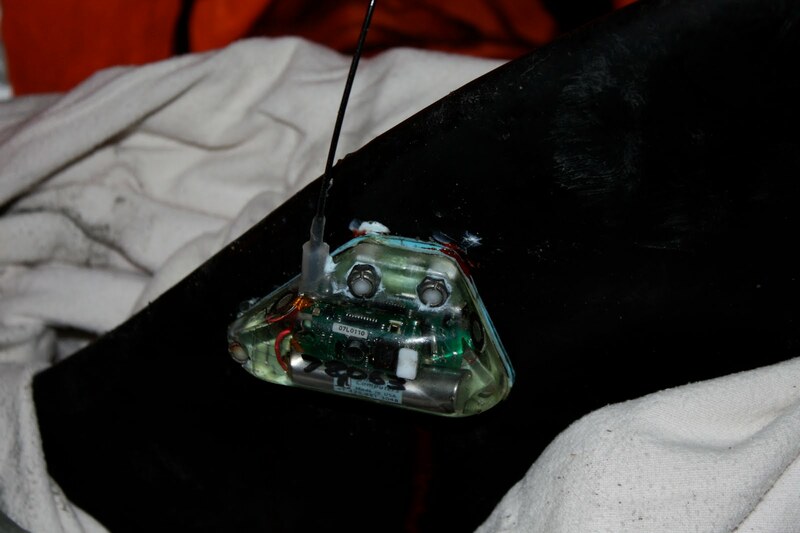 Prior to release, Kate and I tagged two of the dolphins with TDR (time depth recorders) satellite tags from Wildlife Computers. The photo below shows the tag attached to the fin of the dolphin prior to release. 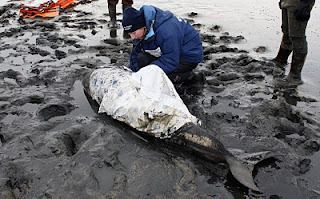 Okay enough with the stranding event history...the animals were released on March 11, 2010 from Provincetown, MA. Since that time the tags have been sending data on the location, dive depth, time at depth and other important behavioral information. Years ago we had no means of determining survival of these mass stranded dolphins that were transported and beach released. 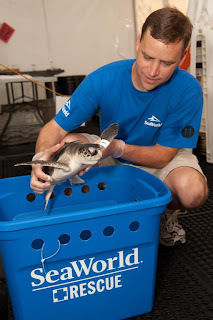 This tagging project has given us great insight into their survival, behavior and habitat use. 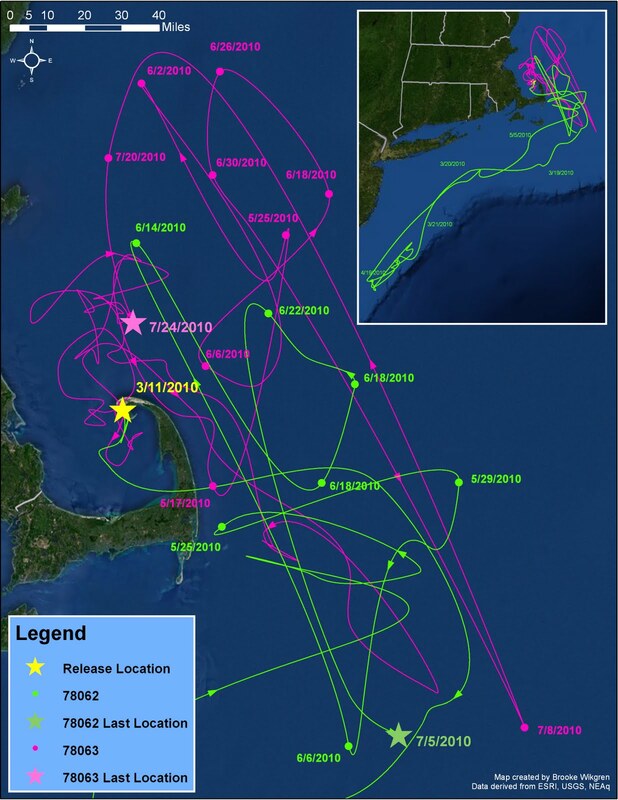 As you will see from their tracks in the map below, both animals have traveled extensively and appear to have re-entered their habitat successfully after a traumatic stranding, relocation and release. It should not be simplified though that this will work for every stranded cetacean (whale, dolphin or porpoise). 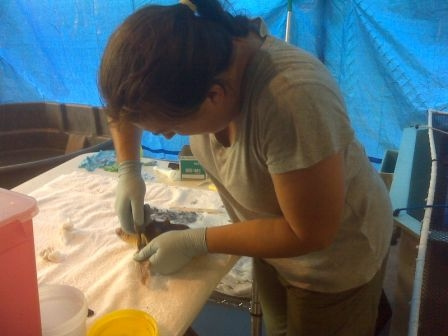 Careful health assessments are performed on each animal to determine if they are fit for transport and release. 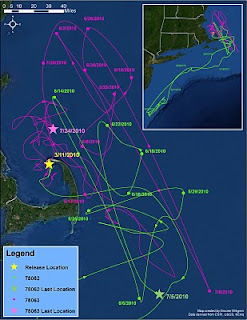 In the map below, the travels of the two dolphins are shown in different colors for ease of viewing. The small inset map in the top right corner highlights the extensive distance traveled by one of the dolphins. This research has been vital to our stranding response and has helped us refine our health assessment protocols, transport methods and release criteria for mass stranded dolphins. 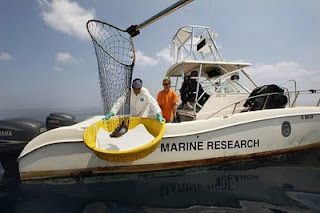 The data collected from this research project has been compiled and was recently submitted for peer-review publication. We patiently await word of its acceptance...I'll keep you posted. Harbor seal pup season has arrived so I thought I would give you an update on what the rescue team has been doing in the field and a reminder of what to do when you see a seal on the beach. 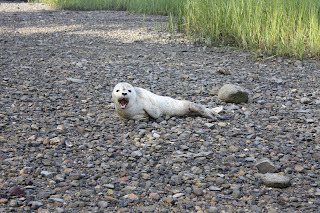 This past week has been fairly busy in the field now that pups are here. 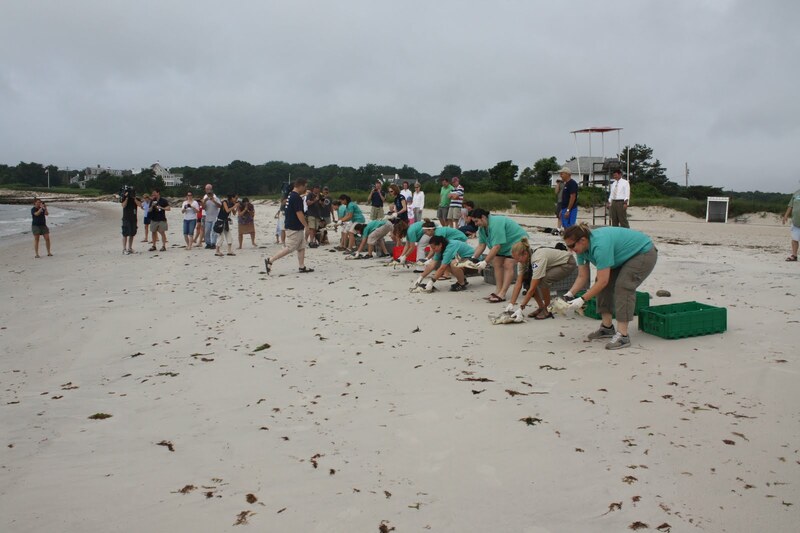 We have transferred two pups to the University of New England (UNE) Marine Animal Rehabilitation Center this last week. The first one was a pup in Winthrop. I actually was playing field volunteer that day and went down with one of our interns to assess the animal in the morning. The seal appeared to be resting on the beach. 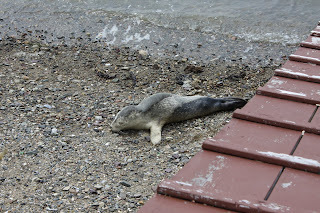 A few wounds were noticeable and the seal was quite thin, but overall behavior was decent. 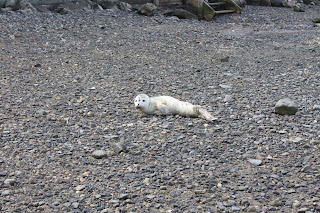 The harbor seal pup during our morning observation. 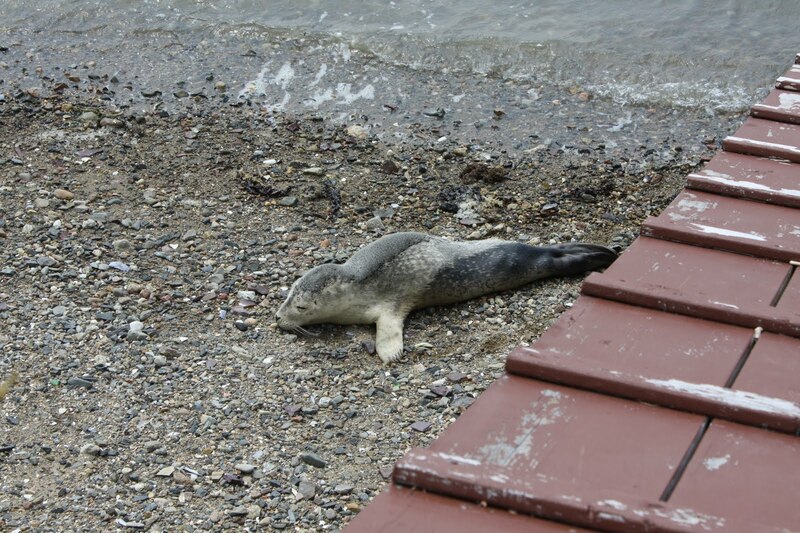 We went back to check on the seal in the afternoon and there was a noticeable decline in behavior. 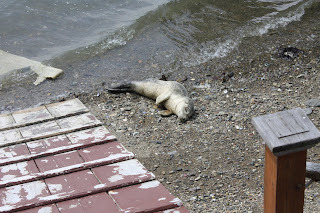 The seal's posture was poor (laying flat) and I noticed the right rear flipper was swollen, among other things. I decided to collect him and he was transferred to UNE. You can notice the difference in posture from the morning pictures and these afternoon pictures. 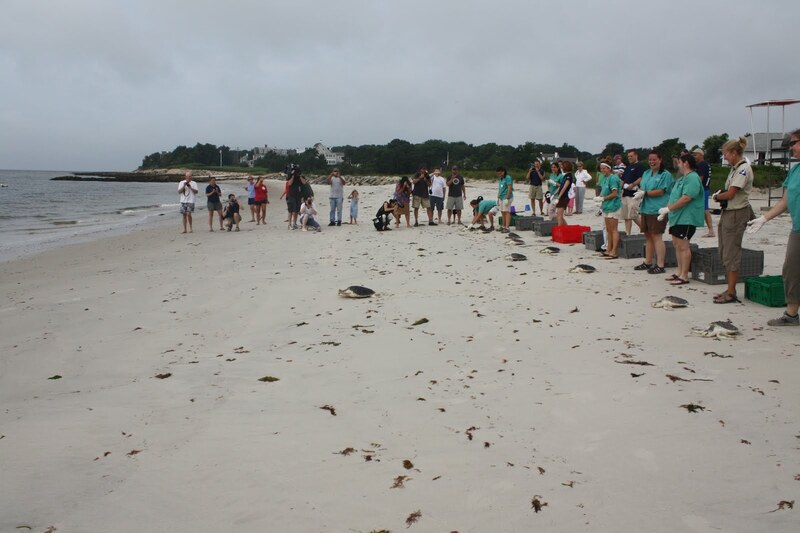 The second seal was down in Duxbury this week and it had multiple wounds. 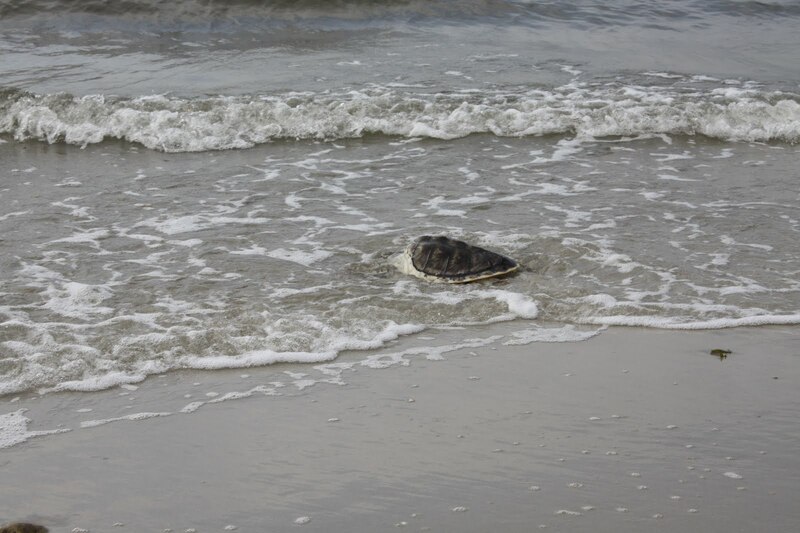 It had been going in and out of the water and moving to different locations on the beach. 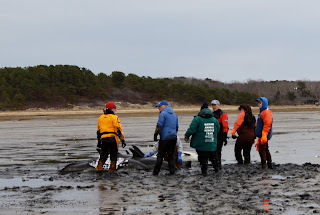 The wounds were a bit concerning for us so the next day when he was spotted, the Duxbury Animal Control Officer and one of our field volunteers were able to kennel him for us. I then met them and did an exam on the seal. 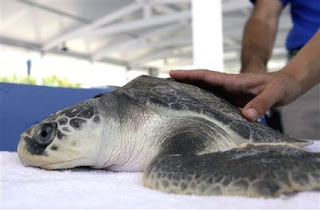 Most of the wounds were infected, his breathing was poor, and he was very lethargic. 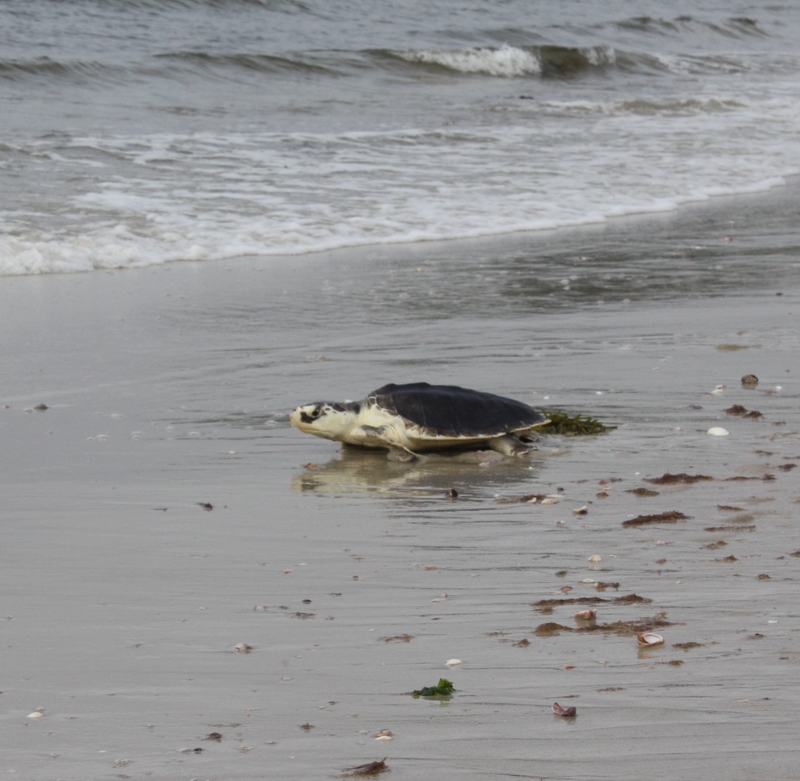 He was also transferred to UNE for care. 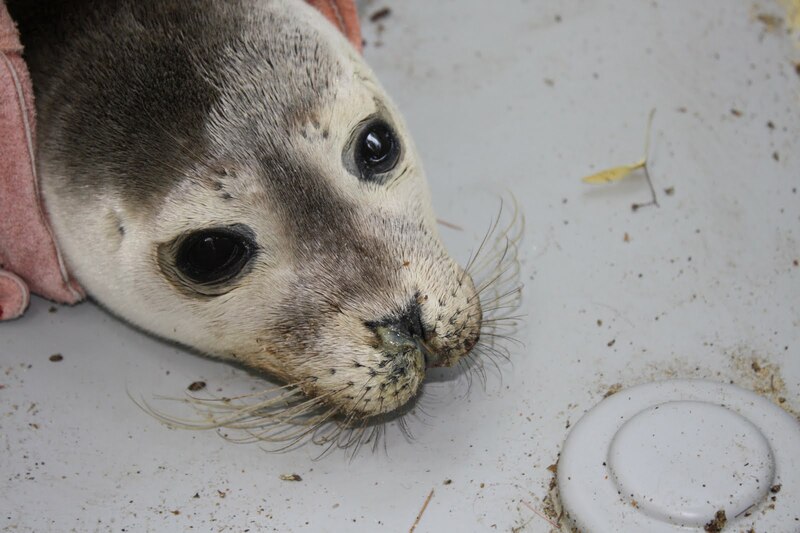 In the photos above you can see some of the wounds and the discharge from the nostrils of the seal pup in Duxbury. 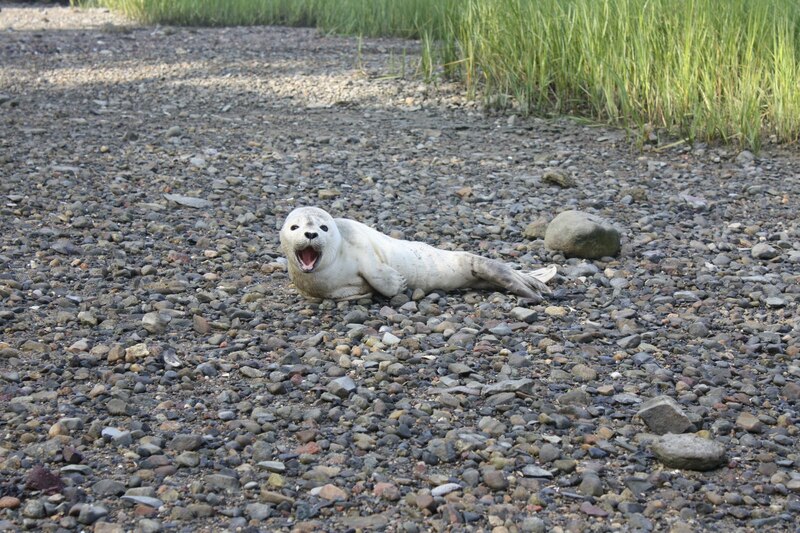 Seals are protected by the Marine Mammal Protection Act, which makes it illegal to touch, harrass, or alter their normal behavior in any way. 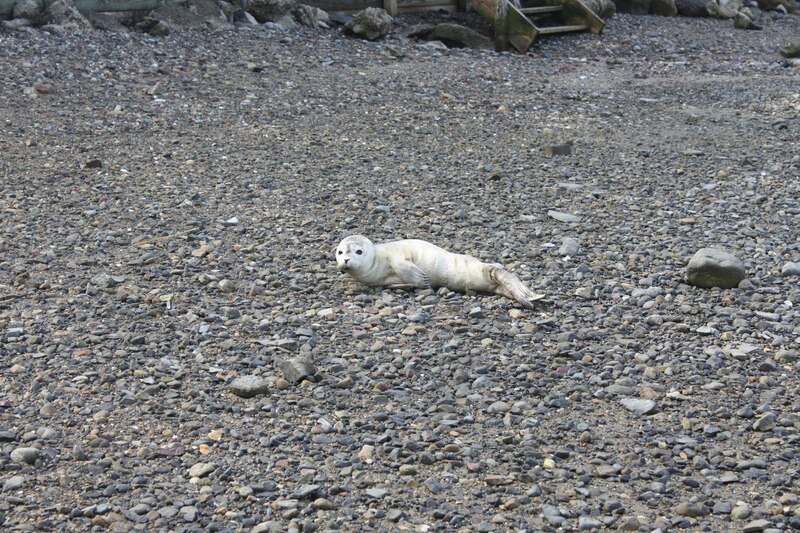 For information on what to do when you see a seal on the beach, check out Adam's post from last year. 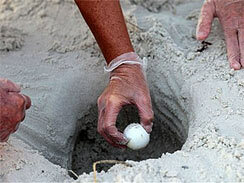 And remember to call our stranding hotline 617-973-5247! This week we released 10 of our Kemp's ridley sea turtles at Dowses Beach in Osterville. 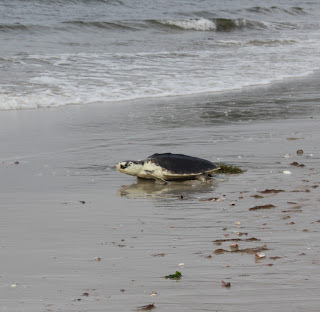 These turtles were released into Nantucket Sound after eight months of rehabilitation. 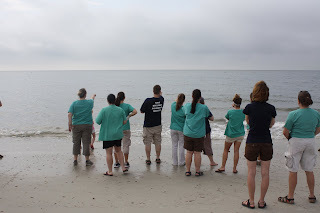 Several of our volunteers came down with the Rescue staff early Wednesday morning to see our patients return to the wild. 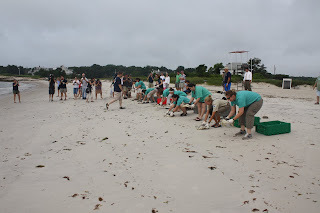 Rescue interns and staff arrived at the Aquarium at 6 a.m. to box up the turtles. 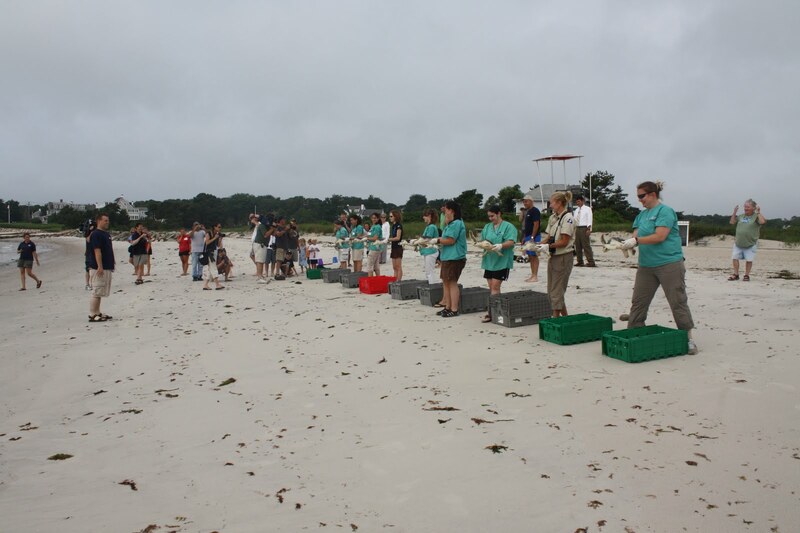 Here they are lined up in front of the Sea Turtle Recovery Room. We arrived at the beach and lined up the turtles. 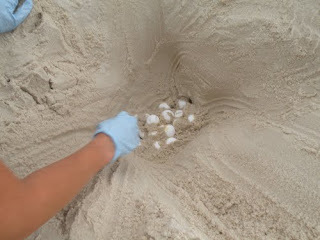 Adam gave our volunteers the signal, and the turtles were placed on the beach to make their way to the water. 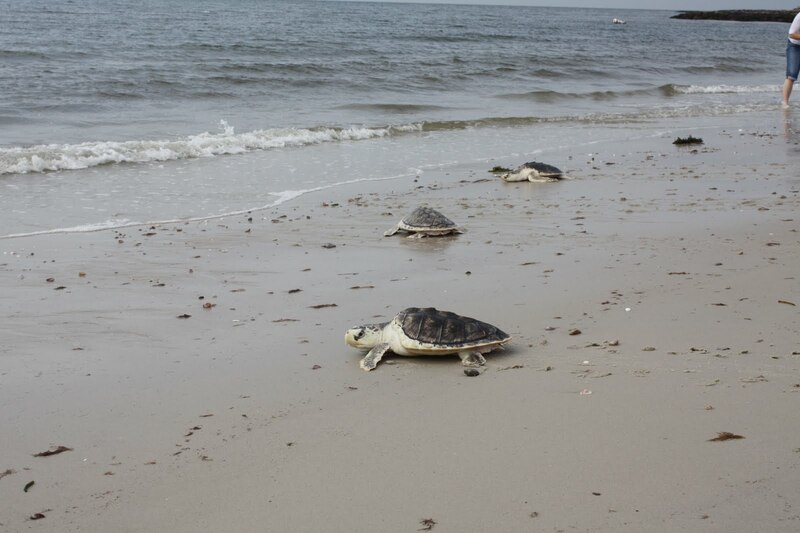 Some turtles were faster than others. Take a look at #82 out in front. 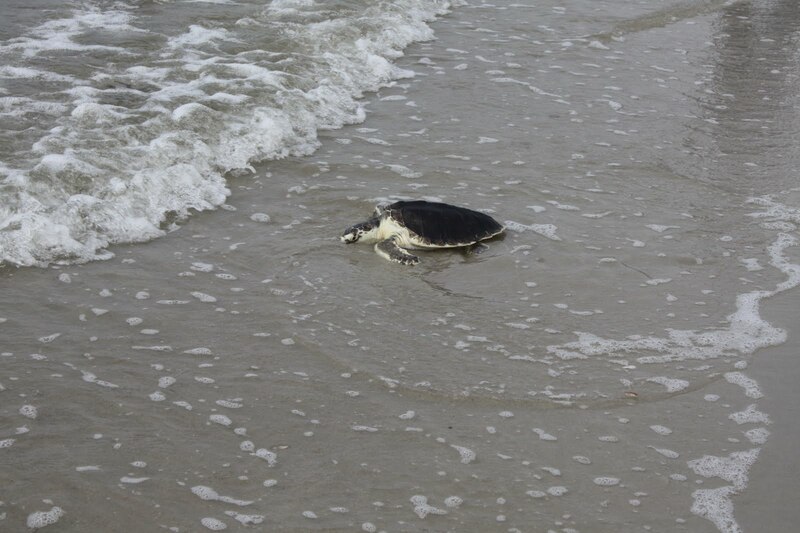 He didn't hesitate at all and was the first to enter the water! #70, in the photo above, was a turtle with pneumonia and went through intensive care to treat his infection. He was nebulized with #57 back in January. Obviously he recovered well. Look at him go! #34 got slightly off course at one point and started heading toward me! He must have recognized me as the person who last took his blood, because he quickly got back on track. Notice him taking another glance to make sure I wasn't following? 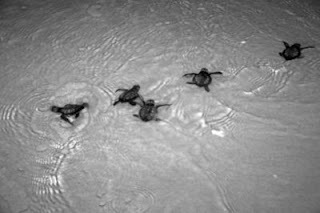 #34 then quickly joined the other turtles and made his way into the water. 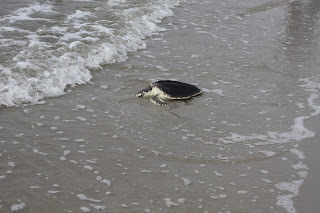 #98 was the slowest turtle and the last to enter the water. I think he enjoyed the extra attention. It was an exciting day for everyone. 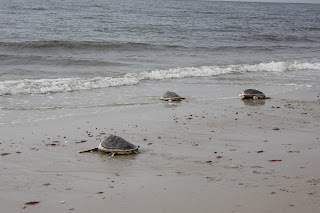 We were even able to see the turtles surface for breaths out in the sound. Adam talked to the media afterwards. 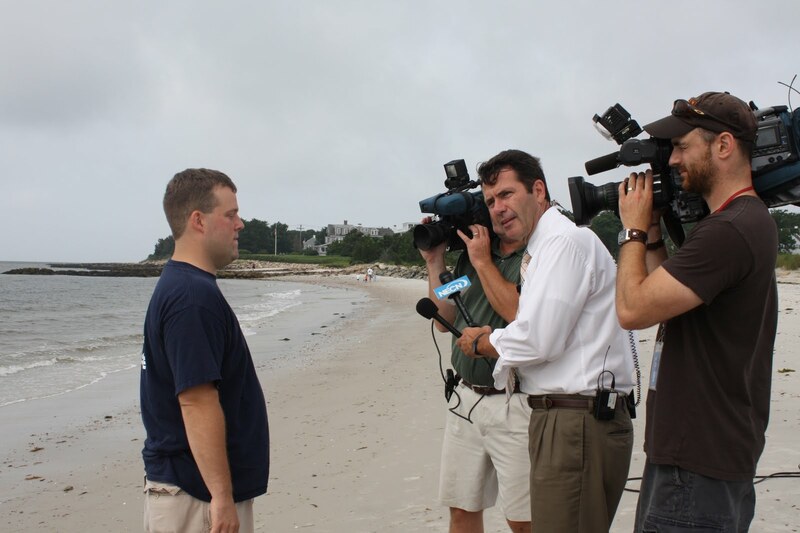 You can find video of the release on NECN and Boston.com. You may be wondering why we are releasing these sea turtles when there are Kemp's ridleys being affected by the oil spill down in the Gulf of Mexico. 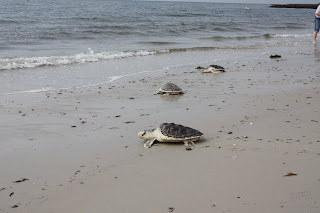 Based on satellite tracking data from past ridleys we have released, these turtles will travel down the East Coast and stay around the Carolinas and Georgia. 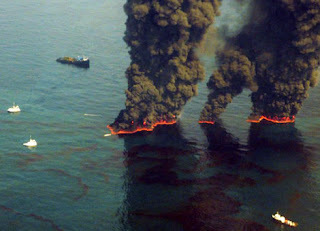 We are confident that they will not enter the Gulf at this point in their lives and that these individuals should not be affected by the spill. One of our past interns, Krystan Wilkinson, is currently a GIS student. She made this map using data from one of our past ridley patients. 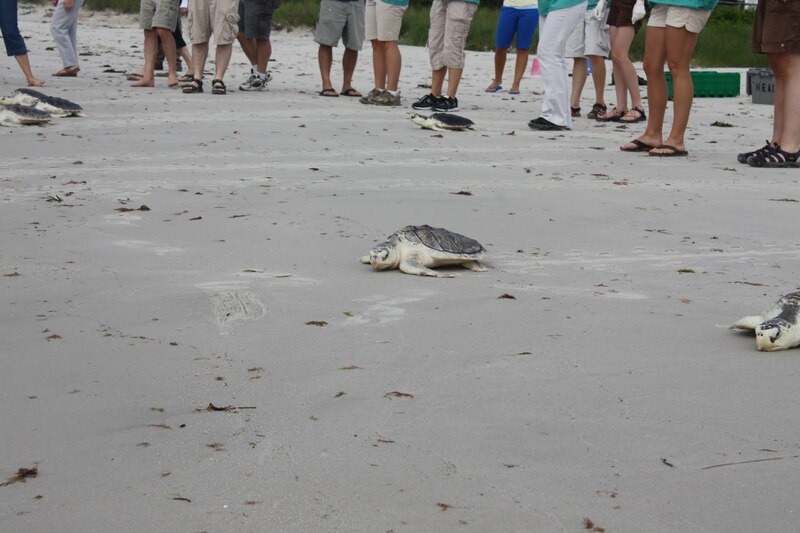 Take a look and you can see the typical path of the Kemp's ridley sea turtles after we release them. We still have eight sea turtles in our Sea Turtle Recovery Room. Most of them will be ready for release in another month or so. We will keep you updated! 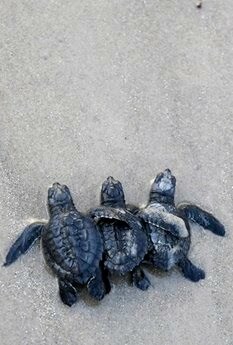 Thank you to everyone for supporting the turtles and to all our volunteers for your hard work in caring for our patients. 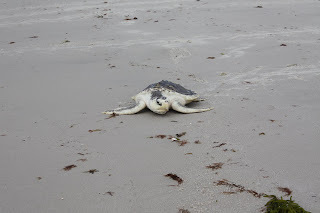 So the Northeast Region again has several experts down in the Gulf looking for and taking care of oiled sea animals. The Riverhead foundation for Marine Research and Preservation has two members of of its staff down on the waters of the Gulf looking for oiled animals. 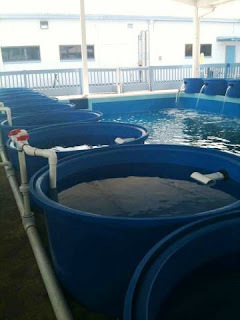 They will be rotating staff members through December or until they are no longer needed in the Gulf. Currently they are working on getting a blog up but have little to no Internet access. Once they do we will let you know. Oh, and a helpful hint given to them for responders is to not store cans or jarred food in the vehicles. They tend to explode due to the heat. I guess Connie wasn't exaggerating (she reports on the heat in this post). Below is some of what the group will be heading out to do! 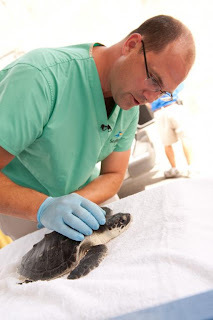 This is a photo of Dr. Brian Stacy collecting an oiled Kemp's ridley. 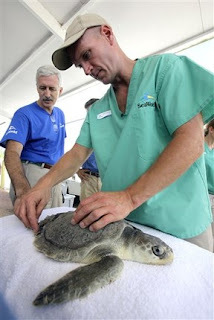 The Virginia Aquarium and Marine Science Center sent one of their staff down to the Aquarium of the Americas last week as well. 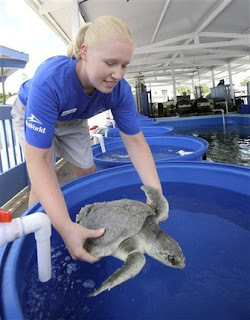 There she has been working with some of the turtles Connie was working with as well as a bottlenose dolphin. You can follow some of her work on the facebook page. 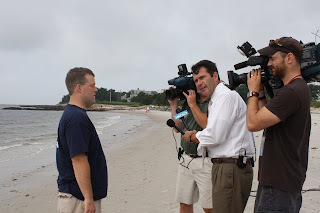 She also got to work with Jeff Corwin as well (you can follow his updates on twitter). 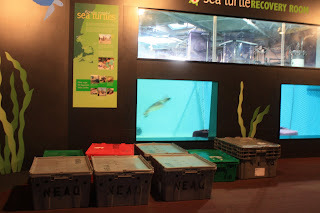 For those of you who do not know of Jeff check out this post about his visit to the New England Aquarium. 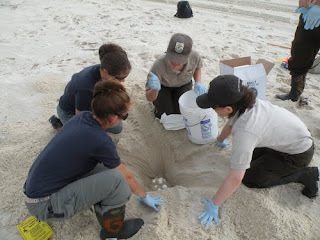 I also stumbled across this FAQ about the northern gulf sea turtle egg relocation on the US Fish and wildlife service website. 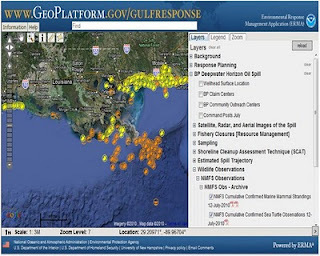 Below is a map from the NOAA Environmental Response Management Application with markers indicating where all the turtles and marine mammals have been sighted so far in the gulf. To all the responders that are either there or are planning on heading down: Stay cool and good luck! 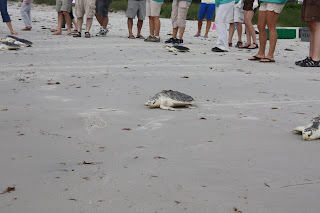 We have very exciting news about Goose, the green sea turtle that was released last August. His satellite tag is transmitting again! Over the past month we have been receiving data from the tag. 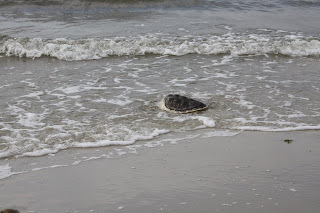 Goose appears to still be in the Gulf Stream in water that is a comfortable temperature for him (close to 70 degrees). 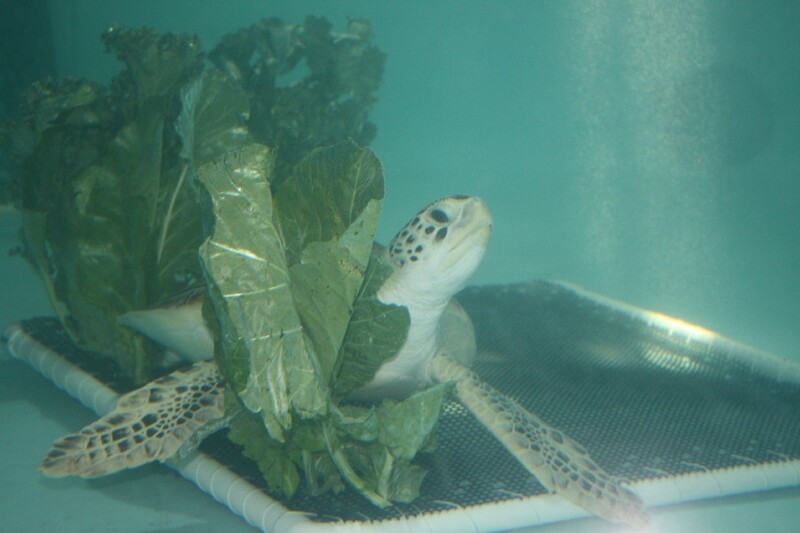 We will be releasing our current green sea turtle patients in another couple months. 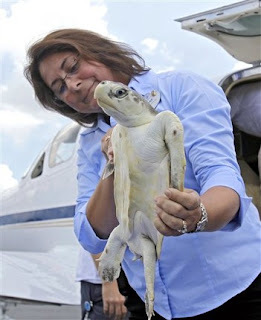 It will be interesting to see if they head out to the Gulf Stream to hang out with Goose. You can follow Goose on seaturtle.org here.